Before you can decide whether you think UK prices are too high, you need to have some notion of where they’ve come from. 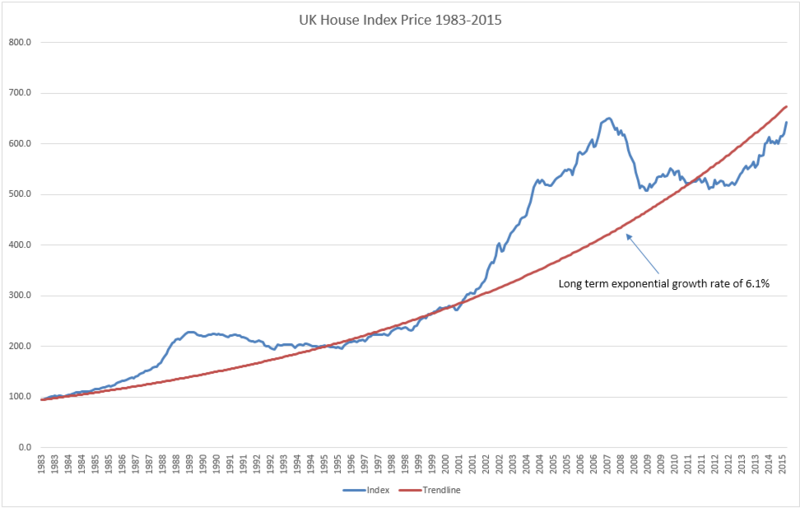 Below is a graph showing roughly the past 30 years of UK house prices, which I’ve compiled using data provided by Lloyds/Halifax. House prices have risen nationally by 428%. London house prices are up by 559%. If you’re interested in a specific UK region (as I am with London) then download Halifax’s data and create your own house price graph. Admirers will swoon, and strangers will stand you rounds at the pub. A pretty impressive looking slope – enough to make a minor Alp self-conscious. 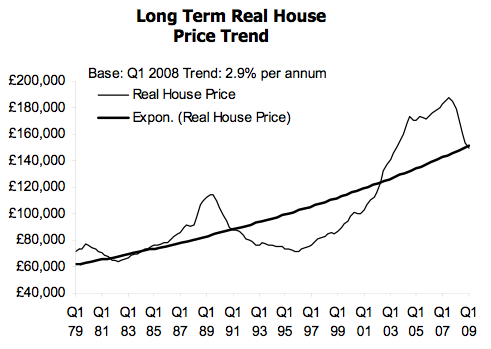 But note that this is a graph of nominal house prices. In other words, the prices are not adjusted for inflation. We can use the Bank of England’s cute inflation calculator to work out roughly1 what the price rises cited by Halifax represent in real terms. UK house prices have risen by 101%. London prices have risen by 124%. That’s obviously a lot less vertigo-inducing than a 400-500% rise in nominal terms, although as we’ll see later on it’s still a lot faster than wages have risen – which is probably why we keep hearing about a housing crisis. (It’s also a reminder of how property has generally tended to protect against inflation). The Nationwide produces a house price index too, and it helpfully offers inflation-adjusted prices from the get-go. The red trend line is the Nationwide’s, not mine. Are real house prices beginning to bottom out like they did in the 1990s? Looks like they might be, albeit with a jerkier graph that hints at market dislocations such as emergency interest rates and the restricted supply of mortgages. How have shares done compared to house prices? We might also compare house price inflation to the historical return from other assets, such as shares. The FTSE 100 was introduced on the January 3rd 1984 at a base level of 1,000 – very close to when Halifax began tracking house prices. Since then the FTSE 100 has risen 440%. If you’d invested £10,000, your real return would be 105%. 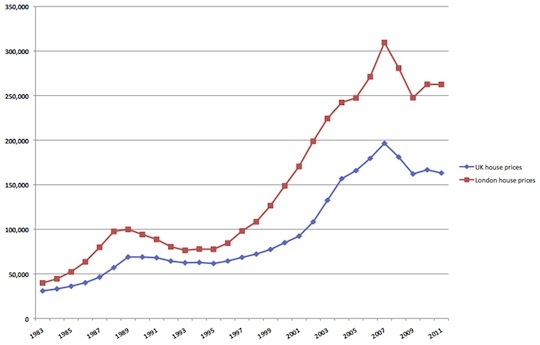 On a 1984-ish to 2011 snapshot, then, it looks like a draw between residential property and shares. But remember that those houses would have required money to be spent on their upkeep, and many home owners would also have splashed out on price-boosting enhancements like loft conversions and extensions. None of those costs are factored into the house price index. In contrast, the equivalent costs to companies should be reflected in their share prices in the long term. Are you also thinking that shares pay a dividend, which isn’t caught by the index’s return? Good spot – and true – but remember that houses also deliver an equivalent, in the form of giving someone somewhere to live (or imputed rent, in economic terms). Finally, the day-to-day level of the stock market is much more volatile than house prices, making point-to-point comparisons with housing a little dangerous. What if we’d done the comparison in 1999? Or 2009? I’ll be coming back to look at this more deeply in a later post. In historical terms, UK houses have clearly been a decent long-term investment for the past 40 years. Over shorter spans, though, the data shows that the property market undergoes booms and busts just like any other asset class. As we’ve seen in the graphs, in recent years boom has most definitely invited cousin bust around to stay, and he’s totally trashed the living room. Prices have accordingly come down a fair bit in the past few years, especially in real terms, though less so in London.2. Arguably, the falls are not as much as we might have expected, given how unemployment has risen, and how difficult it is to get a mortgage. And recently house prices have stabilised, despite neither of those conditions reversing. It’s also worth noting the Halifax and Nationwide data is likely skewed because it’s based on those who need a mortgage – and we’re in a credit crunch. Cash buyers (oligarchs, bankers, wealthy Greek and Italian refuges, and football stars) can bid up prices without any such piffling restrictions, as we’ve seen in Mayfair and Knightsbridge. So the building society data probably over-estimates the price falls. Many economists would have predicted a much bigger house price crash, if they were told a few years ago that the UK would undergo its deepest recession since before World War 2, or that so few first-time buyers would be able to get a mortgage. Maybe things are different this time? I think it’s too soon to say whether house prices having finished falling, given the economic uncertainty. The declines may well resume when interest rates rise, or if unemployment heads higher. For now though, the failure of house prices to drop as much as many predicted before the crash (including me) makes me wonder if I underestimated a structural shift to higher UK house prices in real terms. It’s claimed that Albert Einstein said the definition of insanity is doing the same thing over and over again, and expecting a different result. I agree. I’d like to own a house someday, and I don’t want to keep sitting out the property market if it’s for no purpose, only to watch prices take off once more. “When the facts change, I change my mind,” said the economist Lord Keynes. So did I miss some changed fact in my previous analysis of house prices? As the old socialists used to chant: What about the workers? Next: The house price to earnings ratio. While the increase in the FTSE 100 and UK house prices is similar in real terms since 1984, the impact of gearing through buying a house with a mortgage means that the return on equity from a house purchase would have been much much greater than the return on an investment in the stockmarket over the period. Given the relative valuation of UK house prices versus the stockmarket today, perhaps the clever trade is to borrow as much money as you can to invest in the FTSE 100 over the next 25 years? Any takers? @Edward — Agreed. Gearing is the main reason why property investment has been so good for the UK public, leaving aside the odd bout of negative e.quity blow ups. I don’t really think there’s a safe/cheap way to gear up to buy the FTSE 100 unfortunately. Having explored the various options (spreadbetting, options, cheap loans etc) the only one that offers anything like an attractive risk/reward balance to me is running a mortgage while investing, as discussed elsewhere on this site. Possibly buying an investment trust with a lot of debt on a discount is another option for limited gearing, but you have other risks there. Don’t forget to consider increases in population, average lifetime (increasing demand) as well as land, material and labour cost over the long term (restricting supply) ! 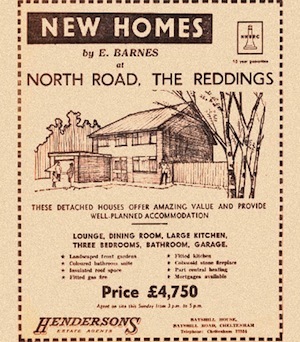 On the subject of historical house prices, the recently published book “Safe As Houses? A Historical Analysis of Property Prices” by Neil Monnery is well worth a read. @Robert – Indeed, I mean to get hold of a copy of that, I think I linked to it once from my Weekend Reading roundup to that affect. @K – Sure. Complicated picture though, as those factors haven’t restricted boom and bust before (e.g. early 90s) or elsewhere (e.g. the US). I am minded to think restricted supply is a bigger issue than I used to in the UK, though, and probably does support gradually increasing real prices to SOME extent. This may be a daft question but is it possible to but an index tracker, or similar product, pegged to the average housing prices? REITs possibly? I’m hoping to move abroad for the next few years so don’t want to buy a house (plus, with the current uncertainty, would rather not put all my eggs in one basket) but at the same time it would be useful to put some of my (limited!) net worth into property. @guy – residential REITs are on the horizon for this year, at least partly due to changes in stamp duty for multiple purchases. 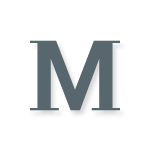 @Guy – As Gadgetmind says, some companies are talking about residential REITs. London and Stamford, for instance. They are available in the US. Some spreadbetters offer the ability to take a view on house prices, but I wouldn’t personally recommend it and have never done it. One could possibly invest in a UK house builder or a specialist property company like Mountview Estates (which buys rent control ‘blighted’ property for eventual resale) to gain some sort of exposure but it would certainly not be a direct correlation to UK house prices or anything like it, and would introduce other risks, too. Even buying LLOY is at least partly a view on UK house prices, I’d suggest! Also, interest rates are important: it is easy to say “houses were cheap in 1984” based on P/E or real prices and ignore the cost of credit, since interest rates were at 10%+ in 1984. I’d wager a new mortgage on an average-price house would cost a similar proportion of earnings in 1984 as today. @Guy: One (some?) of the spread betting firms allow bets on the house price indices, IIRC. Buying shares in house builders like Persminnon also gives you direct exposure to residential house prices; many of those firms retain a significant amount of equity in the houses they build and sell through “shared equity” deals. As well as indirect exposure since their future revenues is linked to future sale prices, of course. Loads of risk here, of course. @The Investor thanks, interesting ideas – i’m not sure if I’m ready to take a punt on Lloyd yet! Would the number of paying members in a household contributing towards the cost of a mortgage/rent be a contributory factor as to why property prices and rents have increased significantly during the past 30 years? I suspect that 30 years ago the ratio of paying household members to mortgage/rent was close to 1:1; whereas today it’s likely much closer to 2:1. Yes, “dinkys” (Dual Income, No Kids, Yet) will always be able to out-bid those with similar earning abilities but where there are additional mouths to feed and feet to shoe. I doubt we could have afforded our first house if my wife hadn’t been working back then. Shame I can’t get her out to work now, but she claims that she’s too busy! Hopefully the market will stay steady throughout 2012. Yes it does depend a lot on family situation and other factors. It is true that someone on the same wage but without a family has a lot more room for manoeuvre. @gadgetmind thanks for your light hearted last comment but it does show you just can’t have it all! @Lemondy — Hah, I’ve fallen victim to your intimate knowledge of the mechanics of inflation before. Anyway, point taken, but all inflation adjusting (and indeed ‘the basket’) has an element of the Looking Glass about it to me. (If a computer is five times more powerful and half the price of five years ago, it seems to me inflation is at least partly a matter of opinion! 😉 ). Definitely agree household income (and as SB and others have said, the number of ‘households’ and the total income flows in and out of that household) is perhaps most relevant indicator, together with the cost of rent and general lending conditions. I will deflate formally by average income and/or household income if I get the chance; I’ll certainly compare growth in the two trend-wise. Thanks for publishing this: I have been on a mission for sometime to convince people around me that buying houses is fine but they are homes not investments. And that rushing to pay the mortgage off feels psychologically right but is not a financially sound decision. The historical data you present illustrates this beautifully! The fundamental reason why house prices have not collapsed in the UK as they have in the US, Ireland and Spain must be that we have not built enough houses for the demand. Compared to all those, we are a small island with quite a large population density, strong NIMBY controls on property development and little public housing. We also have a mentality of owning our own houses and rental contracts are mainly short term. So people have little alternative really to trying to buy. When 2008 occurred I never though that house prices would collapse by much more than they have already. Prophets of doom may have done some simple sums and expected prices to fall much further but (a) people don’t move or even put their houses on the market unless they have to when prices drop, (b) no-one will put their house on the market when they are clearly in negative equity, yet (c) there remains some need for people to move with jobs etc because not everyone will become unemployed. Therefore the slump is not so much in prices but more in numbers of trades. Which is bad news for estate agents. I remember the late ’80s when mortgages climbed to 15% because of the stupidity of trying to shadow the DM. But at the moment interest rates are pretty low and likely to stay that way for a long time as the UK is re-entering recession or at best flat-lining. So while the property market may not be very buoyant, I don’t expect prices to collapse much more – other perhaps than in areas which become particularly depressed. Of course the cynic/sceptic in me has to point out that the legislation that control house building is passed by people who already have their big houses in nice areas thank you very much and by maintaining these controls they ensure the scarcity values on their own properties. @John – Forgot to reply and say I have come around to this way of thinking a bit, too. I was more in the ‘prophet of doom’ camp before. The situation wasn’t *that* different in the early 1990s, and we had a price crash then, too. Perhaps that’s what made me personally resistant to the ‘not enough supply’ argument. However events (including incredibly cheap debt for those that can get it) have proven that constrained supply does seem to have underpinned prices more so than, say, the US or Ireland, where massive over-supply clearly egged things over cliff. Interestingly, constrained supply didn’t save the housebuilders from having to do massive fund-raisings to survive, or their businesses from radically shrinking. I thought they looked like attractive investments in late November, and still feel the same. Anyway, the net result is real house prices (and prices to incomes) probably do warrant having trended higher. The question is to what extent? Yes, we did, and it was nice. I used it as an opportunity to buy my “forever” house, got planning permission to slap another house on some attached land and flogged it, which effectively halved my purchase price over night. I then paid off the remaining mortgage in double-quick time. I won’t tell you what it’s worth now as you’d only hate me even more! Don’t fear the dips: dips are every much of an opportunity to prosper as are the peaks, perhaps more so as brains do well in troughs whereas any old balls will do well in peaks. I don’t fear dips at all, I love them. What I fear is buying into a London market that is already back at or above its highs. @ The Investor – no-one can ever can ever call the highs or lows of any markets, but the London property market does seem to be defying gravity. Anyway, at least you got into UK Commercial Property (UKCM) at a decent price – BestInvest keep failing with both real-time and limit orders, and blame liquidity, but my other online accounts are happy to buy take orders. You can’t talk about the US as one market. For example prices in Phoenix, Detroit, Florida may have fallen up to 40% but in NYC they seem to be doing just fine. The same constraints on supply exist as in London, and the same price pattern is emerging. I bought an apartment in 2010 and it’s apparantly work 10% more than I paid for it, at the very least. @gadgetmind – I am not sure about commercial property. Put it this way – people have to live somewhere even if they haven’t got a job but businesses can fold much quicker than people move or die. There is many a high street around with a few or more boarded up shops but few with boarded up houses except in the poorest of areas. People who lose their jobs will – at least in the short-medium term – still live in the same house and have some support for this. Businesses can fold very quickly and people don’t live in shops or sheds. Or rents can be driven down if a landlord is at all sympathetic to harsh trading conditions. @Matthew – yes London, NYC and other magnets will retain a substantial portion of their real estate ‘wealth’ although it may be (a) that if you had bought in 2008 you may not hav ebeen so lucky and (b) the US seems to be managing its employment rather better than the UK and NYC will be the first place to benefit from that. We are fortunate to live in an area where I think house prices have hardly dipped at all which all goes to show how variable things are in the UK, as you point out for the US. Very interesting reading. I am looking at properties and trying to see how the asking price compares to the price that it was when last sold so I am finding this information of great use to me. I recently wondered about the real lifetime cost of UK property purchase – in relation to lifetime net earnings. This is important as annual wage wage growth has halved in each of past 3 decades – from the high of 17% pa in 70s, 9% pa in 80s, 5% pa in 90s and now 2.5% pa. So in 70s wages doubled every 4 years – compared to 30 years today. The absence of inflation based debt deflation makes a massive difference. I concluded that a 1970 purchase as a baseline of 100 say, cost 300 in 1990 and 500 today. I assumed an 85% 25 year Repayment Mortgage at 8% pa interest (long term net average after stripping out MIRAS) – for a 40 year working life at national average wage. I stripped out Tax/NI for pur[pose of calculating the net lifetime wage – and was obliged to assume that beyond 2012 wage growth will continue at current 2.5% pa. In conclusion – from a standing start today – to buy a 3 bed semi in SE at 300k – would cost a ballpark of 40% of lifetime net wage – with a pension to pay 2/3rds final salary equivalent at age 65 a further 40% of net wage – the balance being tax. London is also a different beast to the rest of the UK. Many investors are looking to buy property in this city as it’s seen as a safe place to invest, which ensures property prices are kept buoyant. It’s a great place to invest – buy the best you can in your first choice area is the rule of thumb! I need to find out the value of my present property as it was at the end of March 1982; where would I go to get that info please? I did my own graph based on Lloyds data and it’s showing a different story i.e. the house prices are up and poised to go above the long-term trend-line. Yes it is a two year old post but the gap has worsened the picture if anything. We have had all sorts of boosts to house prices which have not ended up with a boost to house building, as I would expect – house building takes time to start and is no incentive when land prices are going up for builders to build or develop on land that they own – why bother when the prices are increasing anyway? Permission should be time-limited – use it or lose it – which would concentrate their minds as the price of land substantially would drop if they let the permission to expire. We need at about 230,000 houses a year just to replace broken houses (23 million units typically lasting 100 years), let alone population increase that will require at least another 50,000 houses a year just to stabilise the market. No fiddling with the demand side of the equation is going to do that. It really is stupid. I feel terrible for young people who don’t want to have to rent forever. Is there a follow on article from here or any recent recap of the situation? I’m probably going to end up buying in the next year but I’m very cautious as I currently live with my parents so I’m building a nest egg and secondly my other half cannot work so our expenses situation will dramatically change! Any advice or resources for working out if a specific property is a good punt? To be clear this is for a home, not an investment but I want to avoid negative equity. I’m in Northern Ireland where the data available appears rubbish. I’m also quite surprised I haven’t found any decent resources in terms of logically picking out where you should consider buying. It’s like all these incredibly intelligent and logical people just decide for this topic, they’ll throw in the towel and follow their emotions. About my only consideration for where we’re looking has been a 10mile cycling radius from work, and access to a few amenities. I feel like I should be making a ‘smarter’ decision than only based on the above inputs but I’m struggling to find valuable insights in this regard. Next post: Weekend reading: Are REITs right when saving for a deposit?